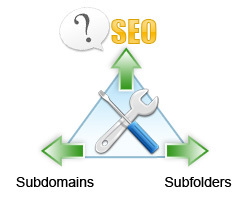 Should I Use Subdomains or Subfolders For SEO Benefit? A fairly common question I hear from people is whether it is better to create web pages in a subdomain, such as ‘seo.techwyse.com’ or in a subfolder such as ‘techwyse.com/seo/’. Webmasters, in many cases are not clear on why to choose one way over the other and do not understand that deciding one of these ways can help greatly in ranking better on search engines. First of all a bit of a better understanding is needed of domains and subdomains. Pre 2007, Google treated all subdomains like they are there very own domain which is unrelated to the main domain. ‘finance.gm.com’ was different from ‘gm.com’. This method was often referred to as host crowding. Since Google only liked to display 2 ‘finds’ per domain, this would challenge that result. What could happen instead was that a company like GM could have an entire page of searches dedicated to them. In December of 2007 Google made a tweak to their algorithm to make this scenario less likely to happen. They began to favour subdomains quite so much. Be sure the the content is distinctly unique from the main domain, and that you have lots of content for it. The other benefit to sub domains, is for branding purposes. Since a sub domain is looked upon as a new and separate domain, you may have a preference to having cadillac.gm.com instead of cadillac.com. In this case they would be sectioning off the content on a separate domain for branding purposes. 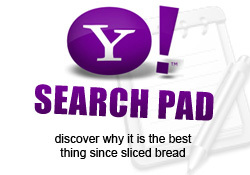 The biggest issue with sub domains, is search engines view them as separate sites. Therefore they have the equivalency of separate domains. With a sub domain, you now have to think about developing it as its own entity. This means bringing in inbound links from other web sites. If, for example you have worked hard to bring in 1,000 inbound links to your main domain, you now have to bring in 1,000 links to your sub domains if you expect similar results, and if you have many of them, you are really piling up the workload for yourself. That’s a very simplistic way of looking at it, but it’s usually enough to sway people to avoid sub-domains. Finally, another negative is that links from the sub domain to the main domain will be looked at as inbound links rather than an internal link and therefore will not distribute link juice. There has also been a history of SEO’s and webmasters using sub domains for spam tactics, which is partially what stemmed Google to filter out overly repetitive sub domains returning in search results. My recommendation when building out your web site is to use folders wherever possible. Aside from the sub domain vs sub folder issue, folders are a nice way to keep your content themed and grouped and helps to keep your web files neatly organized. This is especially useful for larger web sites. For SEO purposes one of the benefits of using sub folders is that those pages will leverage the power of the main domain and will receive a trickle-down effect from the inbound links the main domain has received. In addition, cross-linking from these pages will be natural internal content links and not considered inbound, to allow for link juice to continue to flow through through the site. Another factor of search engine rankings are the number of pages a web site contains. A sub folder will increase those numbers, a sub domain will not. The only purpose I see to using subdomains is really for branding purposes. Usually those purposes are seen more greatly by larger corporations or if you want to establish a separate entity that is still linked visually to your main domain. You can perhaps look at this blog itself for that! In most cases, however, I strongly suggest going the other route. For so many reasons, sub folders are better. They help you grow the relevancy of your core domain, and they are even easier to remember for visitors. Since I am an SEO guy, unless there is an extreme case make sure when facing this very question that you go with sub folders instead of a subdomain! For those looking for further research on this issue, I urge you to read the following two articles. This article is my opinion based upon my industry knowledge. The facts delivered by these two were current as of December 2007. Although they reported them as factual, the end results do not seem to support many of the claims that I read in the articles. Dan: Some good questions there. In your case here is what you would want to remember. A subdomain is essentially recognized as its own website. So in your example you would be creating 3 mini websites when you could instead put the content on the main domain in a subfolder. Putting your content in the main domain means that you are creating a bigger website with more fresh content. 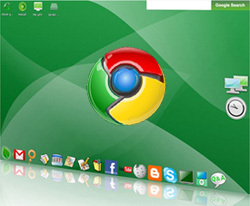 Search engines like this! In terms of SEO, you are generally much better off putting your content in a subfolder on the root domain and creating subfolders. If I'm create a hub site, like about.com, with many many different topics, wouldn't it be better to use subdomains? You want those three, very different categories of content to be treated separately by the search engines, correct? If you were to use the folders, the search engines wouldn't see your site as highly relevant for any one of those categories; but, if you use subdomains, each subdomain site would be see has HIGHLY relevant for their particular category. @ Dothenew: Yes sub domains “can” rank well. But increasing the relevancy, importance and power of the main domain will help more with a sub folder, rather than a sub domain. @ I will ask: Yes, sort of. If the topic is similar, you should definitely use sub folders, but since sub domains are still considered self-contained domains, then you may as well use a brand new domain, if you have content for a completely different topic. @Jay: Thanks for the technical insight. I actually, just found a recent article, which explains things a bit further, and helps to support my view. Your perspective is right, but each one has a different purpose. Am I right? Choosing between the two depends on your topic and site’s requirements. I would like to know about the latest thoughts on this topic. May be someone can provide more information here. It provides not just a blueprint for the right direction, but prevents you from wasting countless hours of your time. My friend who is in the SEO field gave me advice that we can rank sub domains well, the thing is that we cannot rank them simultaneously for the same search queries. By using sub domain for a different purpose we can increase the relevancy of our main domain. I think we can use sub domains for focusing different streams of our business.